It’s been a breakout year for Charles Soule, the creator of the Image comic 27 whose career rapidly accelerated after taking over DC’s Swamp Thing, his very first mainstream comic-book gig. Since then, he’s released the sci-fi graphic novel Strange Attractors through Archaia and become the writer of two more ongoing series, Red Lanterns and Thunderbolts, reenergizing those titles just like he did Swamp Thing. As if three ongoing titles weren’t enough, Soule launches two more series this month, including his most high-profile release yet: Superman/Wonder Woman #1 (DC). Following the romantic exploits of DC’s most forced couple, this first issue fails to make readers care about a relationship that has always felt like an editorial contrivance, particularly because the Wonder Woman who is dating Superman is nothing like the one that appears in Brian Azzarello’s outstanding Wonder Woman series. Azzarello’s interpretation of Diana comes through in this issue when she’s in action, but she’s a completely different character in her downtime. During an expository sparring session between Diana and one of her few remaining Amazon sisters, she laments the fact that she can’t be open about her relationship with Superman; where is the Wonder Woman who has no problem grabbing a guy by the balls? In her regular series, Wonder Woman is the freakin’ god of war, so why is she waiting around for her boyfriend’s approval? The attraction between these characters has been ill defined from the start, with their story focusing more on how the world would react to their pairing rather than the qualities that draw them to each other. Compare the chemistry between Wonder Woman and Superman to her chemistry with Batman in the Justice Leaguecartoonor with Orion in Wonder Woman, and it becomes clear just how rushed their romance is. One of the artists currently dictating DC’s house style, Tony Daniel’s artwork looks like Jim Lee’s, but cleaner. By using less crosshatching, the art is smoother and gives colorist Tomeu Morey the opportunity to add dimension by using more shades and textures. Like Lee, Daniel excels with action sequences, but has trouble when it comes to more emotional storytelling. His characters are stiff in conversation, and his repetitive angles make the dialogue scenes especially bland. The complete opposite of Superman/Wonder Woman, Letter 44 #1 (Oni) showcases the skills that have made Soule such a sought-after commodity. A fascinating hybrid of The West Wing and Alien, the series details President Stephen Blades’ first days in office, a period in which he learns about a mysterious construction operation detected seven years ago in the asteroid belt between Mars and Jupiter. All the seemingly boneheaded decisions made by his predecessor, who sacrificed the country’s economic security to force the U.S. military into long-term overseas conflicts, were made to prepare the country for a potential alien attack, and now Blades has to shoulder that responsibility. Soule does fantastic work establishing Blades’ idealist character, presenting a man full of hope as he begins a new job full of unforeseen challenges. That optimism contrasts with the overwhelming feeling of dread cultivated over the course of the first issue, beginning with an ominous shot of Earth in the void of space, an open target waiting to be taken. Leave it to Jim Woodring to create a book that’s both the prequel and the sequel to one of his previous works. Fran (Fantagraphics) is exactly such a paradox—a graphic novel that is both “continuing and preceding” his 2011 release, Congress Of The Animals. It’s more than just an intellectual exercise, though; if anything, it’s the opposite, an intuitive unfolding of hidden orders and relationships. It’s a heady formula, but as always, Woodring anthropomorphizes his otherworldliness in the form of Frank—his adorably eerie, cartoon man-beast—and his silent, wordless entanglements in the fabric of reality. Here the title character (Frank’s ostensibly distaff counterpart) is given center stage. That stage is stuffed with breathtaking architecture; eye-gouging menageries of grotesque, archetypal tricksters; anachronistic technology like rocket-planes and memory-projectors; and a dizzying fugue of visual motifs suffused with semiotic power. 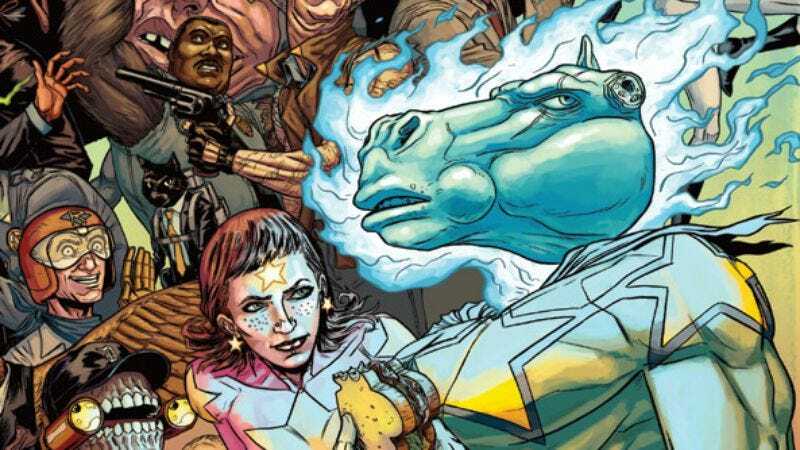 A well-run Kickstarter is great way for independent comic creators to build buzz for their projects, and Ryan Browne’s God Hates Astronauts Volume 1: The Head That Wouldn’t Die! (Image) is one of those crowd-funded success stories, raising five times the amount of its pledge goal for a hardcover collecting the first three issues and a massive amount of extras together. Image Comics releases the paperback collection, and though the series’ future is still uncertain, the world introduced in this first volume demands further exploration. The three issues of Browne’s initial God Hates Astronauts storyline are hilariously absurd, featuring characters like Star Grass, a Superman-like hero driven insane when his head is replaced by that of a vengeful blue cow, and Gnarled Winslow, the police officer patriarch of Family Matters whose arms were pulled off by a gangster owl and replaced with gorilla limbs. Those issues feature delightfully wacky art from Browne, whose off-kilter design sense is complemented by his fluid, expressive linework. The flood of new Vertigo’s ongoing series that began with FBP: Federal Bureau Of Physics #1(originally titled Collider) continues this October with two debuts starring female leads. The first is Ian Edginton and Francesco Trifogli’s Hinterkind, a post-apocalyptic fantasy series starring a heroine in the vein of The Hunger Game’s Katniss Everdeen. Hinterkind #1 is a solid start that isn’t particularly memorable—it has pretty art but a fairly generic story. It lacks the style and immediate hook of Coffin Hill #1 (Vertigo), Caitlin Kittredge and Inaki Miranda’s horror series about a wealthy New England heiress turned police officer who returns to her haunted childhood home after getting shot in the head. The first five pages start the book at a breakneck pace, quickly outlining Eve Coffin’s current situation as a hero cop who comes home to receive a bullet in her skull.